ISLAMABAD: While meeting Afghan President Ashraf Ghani on Tuesday, Chief Of Army Staff (COAS) General Raheel Sharif said that Afghanistan's enemy is also Pakistan's enemy, ISPR said. Chief of army staff said that enemies of both countries are same while meeting Afghan president as well as CEO Dr. Abdullah Abdullah. In this meeting both assured their support in this regard and also said to corporate against terrorism and also promised that their country would not be used against each other. They also discussed to take action against militants in their countries. He also met to Afghan CEO Dr Abdullah Abdullah and he agreed the overall positive path in mutual relations. He also talked about border situation and also intelligence sharing. He was previously visited with Director General Inter-Services Intelligence (ISI) Lt Gen Rizwan Akhtar in Kabul on official visit of a day. 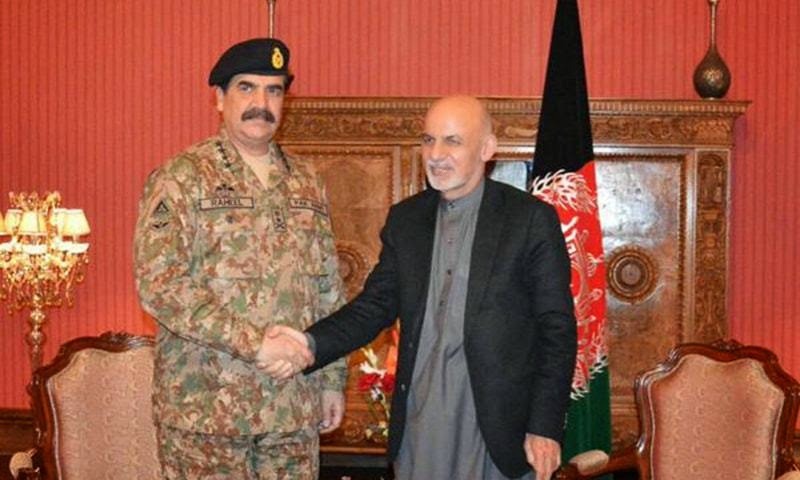 In this stay army chief and DG ISI met to afghan civil and political leadership. It was also communicated in this meeting regarding the border security and also to review it while meeting by both countries military leadership. Coordination required for both countries to work together at their borders regarding same issues. They also discussed regarding Tehreek-i-Taliban Pakistan (TTP) hidden members in Afghanistan. Pakistan military also demanded again to arrest Tehreek-i-Taliban Pakistan (TTP) in earlier basis, who is recently hiding near Afghanistan border. He visited last year after Peshawar attack, Mullah Fazlullah, who take parts in terrorist attempts against Pakistan. He also said to afghan officials regarding the master mind of Peshawar attack by Mullah Fazlullah from Afghanistan. General Raheel also met with International Security Assistance Force (Isaf) commander General Joseph Dunford. Who assured him to coordination with Paksitan regarding terrorism security issues and also he showed his condemned on the Army Public School in Peshawar. Gen Raheel had also met International Security Assistance Force (Isaf) commander General Joseph Dunford. Dunford had condemned the attack on the Army Public School in Peshawar and had assured Pakistan of complete cooperation in countering terrorism and in security-related matters.